SILVA, William Posey (1859-1948), born in Savannah, Georgia, he studied at Chatham Academy and engineering at the University of Virginia. Silva inherited the family chinaware business, which he ran successfully for thirty years. 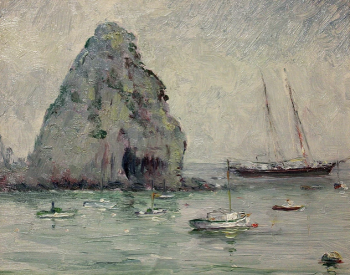 Encouraged by his wife, Silva left the china business in 1907 when he was forty-eight and moved to Paris to pursue a career as a professional artist. In 1887, he moved to Chattanooga, Tennessee, and was called "the finest artist at the turn of the century." He painted in an impressionist style and did many panoramic views of Chattanooga. In 1910 he traveled to the Northeast and spent time in New York City as well as in Massachusetts where he studied with Arthur Dow. After a brief time in Washington, D.C., Silva and his wife moved to Carmel, California in 1914 where, for thirty-five years, he devoted himself to painting cypresses, eucalyptus trees, dunes, and coasts. Silva painted on Santa Catalina Island. He died in California in February of 1948. This page was last edited on 13 October 2018, at 17:00.